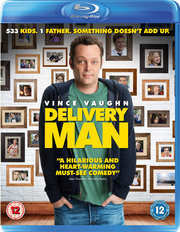 Entertainment One have announced a comedy deftly timed for Fathers Day, out on 9th June is Delivery Man arriving on both DVD and Blu-ray. Directed by Ken Scott and starring Vince Vaughn, Chris Pratt and Cobie Smulders, this comes with extras including a deleted scene and bloopers on both formats, plus Building Family and Vince Vaughn: Off the Cuff featurettes. The recommended retail price will be £15.99 for the standard definition title, and £17.99 for the high def release. The runtime is around 102 minutes. Delivery driver David Wozniak has a life no one would envy and it gets a whole lot worse when he discovers he’s the father to 533 children through sperm donations he made 20 years earlier, with 142 of them bringing a lawsuit demanding to know the identity of their biological father.